At the beginning this thread was about only one site I have spotted near a small hungarian settlement, then it quickly upgraded to larger scales, with many more markers all around the Carpathian basin. File name is already were Aerial archeology, later when collection contained sites also from distant locations, identified on satellite imagery as well, I have also changed thread subject to this more general. By this recent update when collection contains not only sites that I have identified on imagery, but by browsing GE Layer datasets, the time has come for another change. This work -though hard- I try to separate from my burial mounds collection, however some placemarks might sign this sort of earth feature. Some of the markers (e.g. 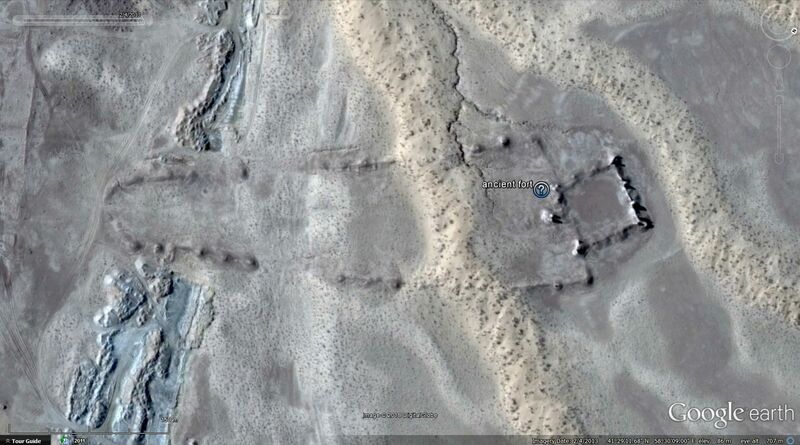 Jadani triple ring, The king grave of sunghir or Arkaim) may have duplicate pairs from the oGEC forums, but I thought to include them as being important sites, also clearly visible on imagery. Here in proposal I must advise for all who interested to visit this archeology site by James Q. Jacobs, download kml content and check the biggest global placemark (and other kml features) collection of ancient sites I know. 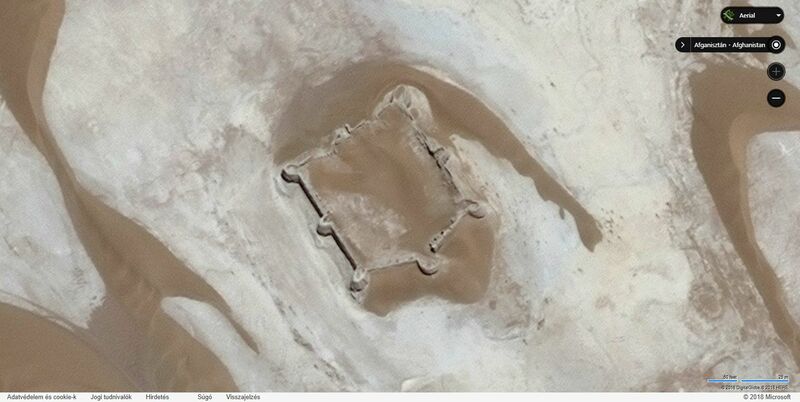 Merged KMZ folder, named "Aerial archeology" is attached to this original post. Opening file you will find all the sites placemarked in this thread sorted into folders and subfolders. By every update I leave most recent updates' subfolder ON and open for you to make it easier to find last update in the KMZ's folder structure. question mark placemarks to sign unidentified sites (no info by GE Layers) / main purpose of this thread is to find out some about these! white circle, square placemarks to sign sites with ID, based on GE Layer infos (Photo- and Community layers) and/or those have been solved by forum contributions. misc. icon placemarks to sign other. (: ...finds by others, special items, etc. Trench lines signed with pale, white line features. Last stage of updates are detailed in the everytime last replies. Turn on Photo- and GE layers for more credit on the locations! Turn off outlines for better visibility of the features on imagery! No further information* yet about these interesting (one time) objects next to Medgyesegyháza remaining as clearly artificial soil pattern deviances with different surface color. I have browsed through all historical maps and descriptions of the area, also have asked some locals, but no clues yet. However on homepage (hungarian) of the settlement editor states that the surrounding area were inhabited for at least a thousand years, 4 mounds (? ), also 3 Árpád-age (1000 - 1301 AD) church ruins and numerous middle-age village remains were excavated; not a sign on old maps, not a word about exact location of a mound (kurgan) or any fortification around the site I could find yet. Now dear archeo-faces of GEC let's gather and say something! By this time it is clear that these on screenshot attached are Bronze-age fortified sites, parts of a defense network due to protect also main trade routes. According to a local archeologist, the northern trench/wall system is from the late-, the southern double ring (earthfort) is from the early- or middle bronze-age. You marked an interesting archeological feature. At least it gave me the interest to look a bit at the remarkable history of Hungary and in particular the grasslands ecosystem. In your earlier post on Kurgans of Hungary, you already have provided a remarkable data base of ‘earth mounds’. But as you remarked this is quite different. Since the earthworks you found are visible through the soil colour primarily, sometimes vegetation enhances the structures, sometimes they disappear completely as the historical imagery shows. The soils in this area would mostly be Phaeozems (using the international classification) which have a dark, humus rich top layer- A-horizon, easily with a thickness of 50 cm (as result of the accumulation of organic material through the decomposition of the steppe grasses over time) over a light parent material. The thickness and colour of the A-horizon, may be important in the interpretation of the earthworks as the present surface topography of the earthworks only vary by centimeters and decimeters. Of course the farming in the last hundred years has had some impact. Not too far away, in a similar environmental setting I found a reference a Geophysical Survey at archaeological site Kaszaper, Békés County, Hungary by Peter Milo, László Lichtenstein, Zoltán Rózsa, Tomáš Tencer, Zoltán Fekete et MarekVlach. This could provide some hints for your site as there appear to be some similarities. Below is a picture of the Kaszaper site. I have added your own place mark for the Kurgan as well. This site was settled during the Bronze Age and Medieval Age. Dominant object is the stronghold dated in the Gáva culture (late Bronze Age). The stronghold covers an area about 240 by 280 m. The survey detects also large settlement activities from the medieval period. In the west part of stronghold there are traces of medieval church with cemetery, excavated in years1938 and 2003. They detected – ditch system from the Bronze Age and medieval Period, palisades, traces of settlements, pits, houses and maybe graves. Just as a comparison to GE images for your site; below an image from Apple maps. In some areas it provides a clearer image in other areas, the double ring further away is not visible at all. I just did not look around well enough to find those. Thanks for the excellent searchwork and essential clues! This recent find by me is probably nothing to do with the trench-duct-mound defence systems I think we are talking about even if not its old age. A 50 ms average width (double walled) linear feature as seen on sat/aerial imagery. Both endings are connected to existing channels which both are ancient water flows as well. It stretches 11 kms long from Reformátuskovácsháza, leads next to Tatársánc (Tatar trench) arceological site, turns 45 degrees to NE and goes along 8 kms near perfectly straight. Passes Nagybánhegyes and connects to another channel. From The First Military Survey (1763-1787) there is no sign of it on historical maps of Arcanum, so even if not ancient, must be rather old. Most likely it was a duct as well, connecting the two ancient waterflows. From various sources (this one is hungarian so as wikipedia article) we know that since János Banner, researches proved: it is about Tatars only in its name, but the trench/duct/mound system was built by the Avars long before the Tatar invasions and is dated between the Late-Bronze- and Early-Iron Age, cca. 900-800 BC* in defence of Schytian and/or Celtic attacks. main-step partial scales look similar to "our" objects. Maybe these were already studied (only my "armchair exploration" was not exhaustive enough), maybe not. One thing I am sure now: we found something artificial that really old. Some History Illustrated as paintings on the canvas of Earth's surface. The time has come I made a merged KMZ folder, named "Aerial archeology" and attached it to the original post. By this contribution I have added this site (mark and outline) in subfolder: "linear structure, Nagybánhegyes"
Turn on Photo- and GE layers for more credit on the locations. A superb thread, gentlemen! Those are indeed interesting features and impressive research by both of you. There are many such places in UK. ... Please see attached kmz and jpeg. There's definitely remains of ancient activity. The resulting geometry figure is interestingly meaningfull, and several interceptions with roads (old pathways) and land délimitations (these are inherited from gen to gen) consolidate the reality of the figure. Now it may all be stemmed from my imagination, because no other relevant source of information available (at this point), but am 50% sure the diagram not random. Thanks for the interesting response and valuable new marks of your new "suspicious" findings! I have to confess, I have ever been bad at maths, so sorry if I miss the "beauty" of equations of numbers and greek letters, you mathscholars mention often so excited. But keep your chin up! This is the very best place where you have good chanches to bump into "learned-friens" who will appreciate your calculations well! One piece of advice: more patience around here! You have just registered few days ago, but in some of your threads I feel you upset that you have not received a reply so far. Your threads are "meaty" even for a mathematic, do not talk about me! Try to pay more attention to the landmarks on GE you find with your method than to formulae and your posts might turn more "digestible" for a wider public. Now I do not talk about your 'paralell lines' finding, which one is simply so odd that no one have any ideas yet. -We have to wait for the answer and might propose other questions meanwhile. Sometimes months are passing until a good response done, but I think it is better to receive a valuable reply later, than a "hmm.." or "whoa!" instantly. "Good piece of work presumes enough amount of time" -we say here in Hungary. Check this article.pdf (eng) from 2013 autumn on hungarianarchaeology.hu (eng) e-journal page! Around 1300 B.C. significant changes in the structure of settlements can be observed in the southern part of the Great Hungarian Plain, as a result of which a series of fortified settlements was established in the BékésCsanád loess plateau and the Temesköz regions. These changes indicate important political, economic and ideological transformations in the area. Within the framework of the project presented here we are examining these changes through investigations into the earthworks in the vicinity of Csanádpalota and the presumably multi-tiered settlement system connected with it. The research may provide new perspectives for the interpretation of the Late Bronze Age in the southern part of the Great Hungarian Plain. The other great source I have used is z-studarch.ro (eng), another sort of Archeological journal, exactly this article.pdf (eng) from 26.1.2012. The article discusses not only the evidence of military conflicts and implicitly warriors within the Lower Mureş Valley during the Late Bronze Age chronological horizon, but it is also a historiographical and theoretical approach of the topic. Fortifi cations researched in Sântana, Corneşti and Munar are the first indications of conflictive situations. The presence of bronze items showing clear traces of use, such as those discovered in Pecica, Păuliş, Felnac and Sântana is yet another indication. One can also mention the numerous prestige items discovered in the area, indicating a well established social hierarchy. The excavations in Sântana and Corneşti allowed specialists to establish the fact that the fortifications systems were burnt and even the area of a possible attack was identified at Sântana. Updated KMZ attached to original post. By this contribution I have added 7 more sites in subfolder: "miscellaneous earthworks"
Have just updated KMZ attached to the original posting. Some further linear structures, two suspicious sites and the most interesting: another double ring structure next to Billéd with the same size-parameters of the one by Medgyesegyháza. Ending you will find an 'other sites' folder, where I have put two other duplicates from oGEC I have thought important to be included. Please read my edited proposal for this thread and download updated kmz from original post! Archeo expert acquaintance warned me that these* are marks of standing water (*plural as another similar structure with smaller scales have been found since - check UPDATE 2017.MAR.02. ), still I let it here and kmz as well, supplemented with the water stand option. Have already checked some archeo maps from wikipedia and other sources, but no relevant info on this particular site. Khazars, Volga Bolgars, Pechenegs and who knows how many more nations of history settled there for shorter or longer periods. No layer info. - Opinions welcome! 75+ km long linear earth feature - Russia. With that number of turns and zig-zag must not been road or canal, some kind of defense line would be my best guess. Maybe not as ancient - probably some WW trenches? No layer info. Any help would be great! No layer info, but I think we can keep our point of view about these. In this update -amongst many known, but not placemarked sites- I share some new findings of mine with no further information so far. 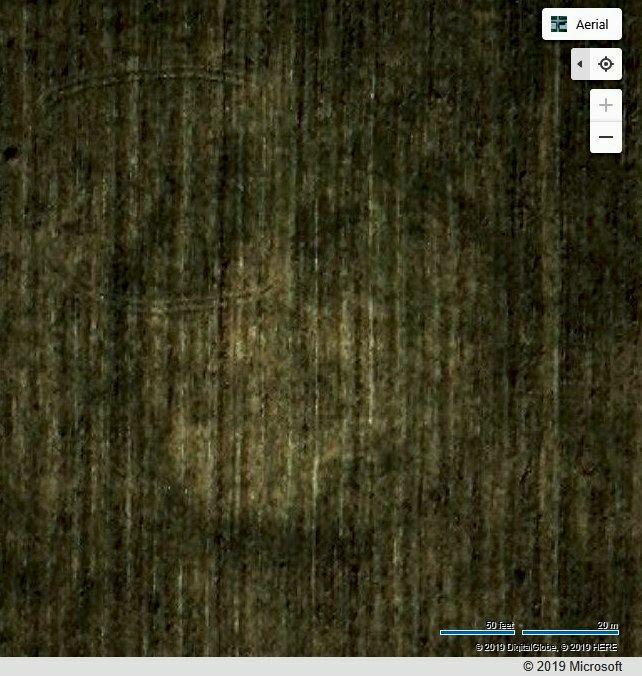 The one -and most interesting- I give as an example here is the "Ukrainian small-brother" of the tangential earthwork circles in Russia I have found by last update. Archeo expert acquaintance warned me that these are marks of standing water, still I let it here and kmz as well, supplemented with the water stand option. 49°19'26.08"N, 31°52'10.12"E - Opinions welcome! 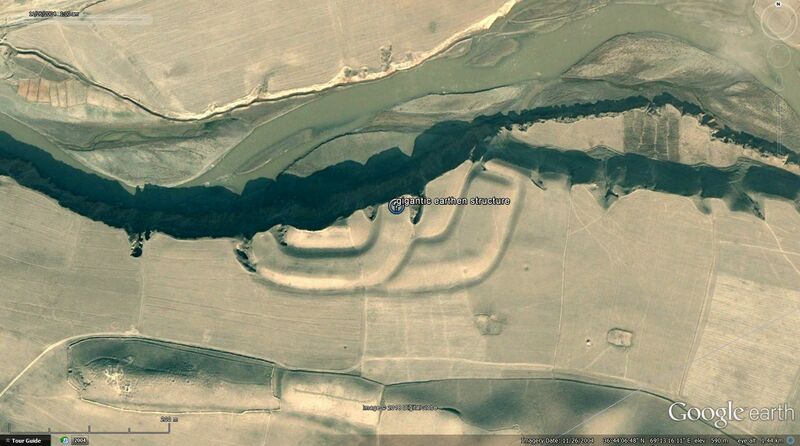 Another earth feature I have marked with lines (lines/trench lines subfolder) are possible signs of (WW?) trench lines, only some further info needed about the age. I give no coordinates, check mentioned subfolder! - Any info would be great to close this "zig-zag-lines question" at last! All features (sites) in line-folder (except the ones in the trench lines subfolder) are having also placemarks set to different imagery timestamps, so only you have to doubleclick to each for best aerial visibility. Download updated kmz from original post! For my first find, topic-starter two earth features at Medgyesegyháza I have recently got some, a bit more detailed informations, given by local archeologist. They did a field work with the Munkácsy Museum and ascertained that the northern trench/wall system is from the late-, the southern double ring (earthfort) is from the early- or middle bronze-age. Now in reply I will ask whether these could be related to a particular group of people, to an exact nation or culture. By this update, besides 11 new findings at issue and some other (WW?) trench sections, 4 identified sites (as Boyarskaya petroglyphs, Uzenhyr archaeological site, Saigachiy mine and a Roman rampart) also can be find in recent subfolder. Opinions for all marked sites in question and any additional info on identified sites welcome! Double linear structure near Billéd (where other double-ring feature had been marked by a previous update) have been spotted, marked and outlined with help of different imagery on HERE Maps. Thracian Cult Complex 41°22'54.90"N, 25°13'22.97"E .
3 sections of probable trench lines. ancient stone sculptures - steppe idols- in the backyard of a village house! Countries involved with update: Hungary, Serbia, Ukraine, Russia, China, Peru. By this update 13 sites with some ID and 5 sites with no further info enabled by opening kmz file attached to original post! thanks for attention and help in advance! also 9 "no-info" and 18 identified sites included in this update. all new markers of this update sign locations of circular soil- or cropmarks (in company of a gratis 3D structure), known (3) and unknown (9) as well. I have already searched through days to find something about these with no success ... even for an opinion I would be very grateful! kmz file, updated with many questions (red circle marks) and some info-spots (white) attached to OP.